LOCATED IN THE QUIET, well-established suburb of Northcliff, north – west of the city of Johannesburg, this beautiful thatched Lodge makes for the ideal start or end point of your holiday. It is also suited to those spending a few days in Johannesburg but not wanting the formality of a hotel. With close proximity to shops, restaurants, banks, cinemas, highways, public transport, golf courses, and of course the delightful Emmarentia Dam, this Lodge has an idyllic setting. A lovely garden, swimming pool, cosy pub, shop and restaurant are available to guests. Day tours of Soweto / City / Pretoria and other attractions can be booked on arrival. Off street parking available. We look forward to enhancing your stay in Johannesburg. 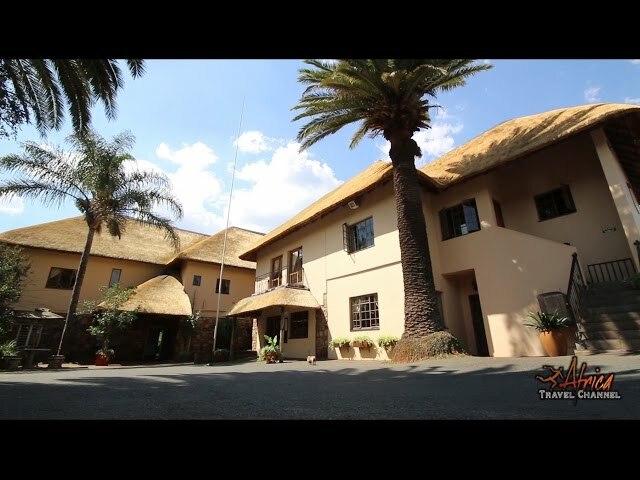 The Greenfire Lodge Johannesburg is situated in Northcliff, north–west of Johannesburg. This beautiful thatched Lodge makes for the ideal stop over before starting or at the end of your holiday. With close proximity to shops, restaurants, banks, cinemas, highways, public transport, and of course the delightful Emmarentia Dam, this Lodge has an idyllic setting. A lovely garden, swimming pool, shop and restaurant are available to guests. Day tours can be booked on arrival.